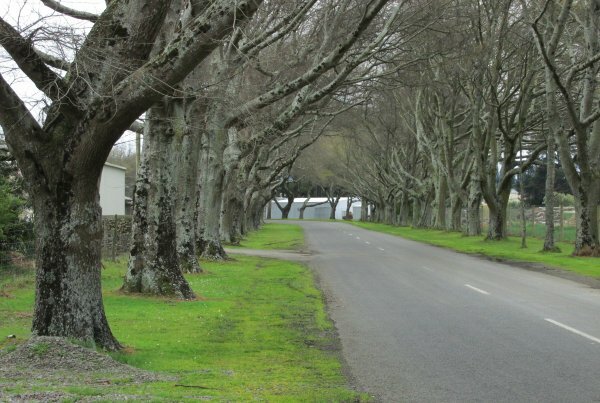 Winter, G. & Hopkins, P.
'There are 63 trees in this avenue lining the main road to the now defunct Waingawa Meat Works. Although the trees carry a large amount of dead branches low down on the trunk they form a spectacular avenue. They are believed to be a naturally occurring hybrid between Q. phellos and Q. rubra' (Hopkins 1991). Established in 1909 and operating for much of the 20th century, the Waingawa meat works was the Wairarapa’s largest employer. The works closed in 1989 when killing was centralised at new plants in southern Hawke’s Bay. By 2006, the buildings were derelict. 01 Jan 1991 Winter, G. & Hopkins, P.
Lining the drive to the former Meat Works site.